Lisa Evans is a Licensed Residential Real Estate Broker specializing in Chicago and the western suburbs. After working in hospitality sales and engaging in customer relations for over 10 years, moving into real estate was a natural fit for her. A Chicago native, Lisa has lived in California and Louisiana, but eventually made her way back to her Chicago roots, currently residing in Oak Park. With her extensive knowledge of Chicago neighborhoods and her knack for seamless communication, Lisa is able to guide clients to their perfect new home. Whether you’re looking for a trendy loft in West Loop, or a laid back historic greystone in Logan Square- Lisa takes the stress out of real estate and puts your needs first. 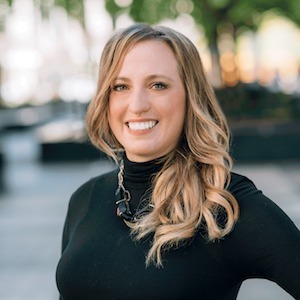 She joined Kat Barry’s team at Compass in October 2018, and is excited to use experience + innovative tools to streamline her clients’ experience even more. In her free time Lisa loves to travel with her new husband Tim and their dog Daisy. Most recently they went on a cross country trip and stayed in Yurts in the mountains of New Mexico. When she is not enjoying the outdoors, you can find her experiencing new restaurants and relaxing with a glass of wine with her friends and family.